hirty years ago Bonnie Meltzer felt isolated and alone living on the North Portland Peninsula. Nowadays the area is full of artists who network and coordinate events  including this summer's third annual St. Johns Window Project, a partnership between the artists and businesses. Bonnie's studio, which she compares in size to the Irvington, N.J., apartment she grew up in, is stuffed to the rafters with all her materials and tools. 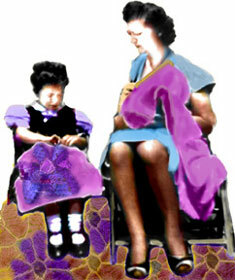 Visitors can make an appointment to see her artwork and the studio. Using unusual materials and techniques, Bonnie Meltzer combines crocheted wire, digital photography and recycled computer parts in her work. "Menopause Psykter," crocheted wire, found objects, digital photgraphy. "As new materials become available to me I add them to my toolbox," she said. "Recycled computer parts and wire became part of that box in 1974, long before I even knew how to turn on a computer." Since '85, Bonnie has been using a Macintosh to design her art and, for more than a decade, she's added manipulated digital photography to the pieces. The crochet ties the disparate materials and techniques together with structure, transparency and pattern. "My goal is to use the materials and techniques that best express a particular idea and integrate them thoroughly into an artwork," she said. One of her recent devices for using mixed media is to make a wood armature for her crocheted figures or vases. The wood framework opens up possibilities for adding color and for screwing on found objects. "I started doing this because my hands didn't like crocheting all day," she said. "I needed to vary my activities. "What started as a way to save my hands forced me into a much more interesting way of working." Bonnie thinks of herself as an observer of our time and place, and uses the Internet as a major source of information. Though she may put in a lot of time doing research for a piece, 99 percent of it could end up unused. 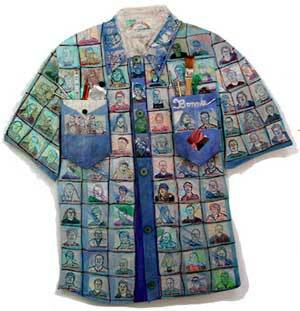 "Work Shirt," digital photography printed on maps and found objects on painted wood. "The journey is still incredibly interesting," she said. "I can hardly read one article online without doing a search on something within that article. "The Internet has validated how I think; one thought jumps to another and another until the last thought doesn't seem to have any relationship to the first, but the connecting thread is there." Bonnie's art doesn't always begin with a plan or idea. Sometimes she simply starts manipulating materials, layering computer parts and bits of crocheted wire on painted boards, screening or a metallic grid. "I like to let the serendipity happen," she said. "Sometimes the mind's eye fools me and I have to redo a part, but more often than not I plan things out using my best apprentice in my studio  my computer." Bonnie scans computer parts and other objects then puts them together using Photoshop. This is especially useful for her commissioned pieces. "I can shrink the resulting plan and place it in a photo of the room," she said. "I can enlarge the drawing, make a template for construction, then take the template to the client so they can see how it fits in the real room." 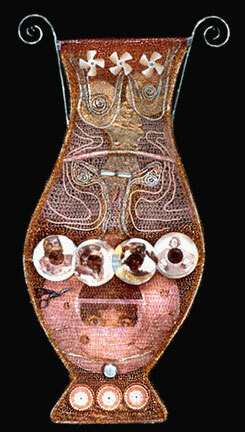 "2000 Supreme Court: Torn, Tattered & Tarnished," collage, crocheted wire, found objects, metal on painted wood. Ideas and themes Bonnie likes to express in her work include: social and political commentary, communication, memory, technology and portraits showing the cycle of life or a particular stage in life. Her Greek vases are both abstract and pictorial with scenes from contemporary life. 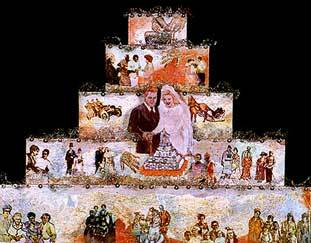 "Many times all the themes are wound into one piece just as the materials I use cross borders of categories," she said. 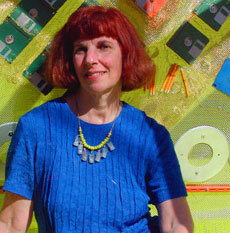 Although some of her work is abstract, even those can incorporate themes from the materials she uses: namely, computer parts. "The very names of the computer parts are ripe for subject matter and metaphor," she said. "It's no accident that so many of my pieces have the word 'memory' in their titles." Several of Bonnie's pieces pay homage to mentors  her mother who taught her to embroider, her grandmother who passed on the making-things-from-scratch gene and her college textiles teacher who took a special interest in Bonnie and her development as an artist. "I grew up in the days when there were still art teachers in grade school," she said. "They all kept their eyes out for me, giving me art materials and taking me to New York to see museums, art schools and musicals." The encouragement Bonnie received from her teachers continued through college and graduate school. "Maybe it was the schools I went to or the particular grouping of individuals," she said, "but I didn't experience the put downs or shunning that many women artists my age experienced in school. "The caring treatment I received as a student has shaped me as a teacher." "One Family," found objects, digital photographs on old maps and crocheted wire on painted wood. Bonnie began her teaching career as a high school art instructor. After three years she left to get her MFA at the University of Washington. Since then, she's taught short-term workshops all over the country. "It was logical that I taught crocheting and other fiber techniques in the '70s, but then a career-changing event happened  I became an early adapter of technology," she said. That's when Bonnie bought a Macintosh and taught herself how to use it. After an article in the Oregonian told how Bonnie used her Mac to design an exhibit at the Children's Museum, she was asked to speak at a computer-education conference. Since then, Bonnie has gone to schools, conferences, colleges and clubs to teach hands-on digital drawing and digital photography to artists, teachers and children. 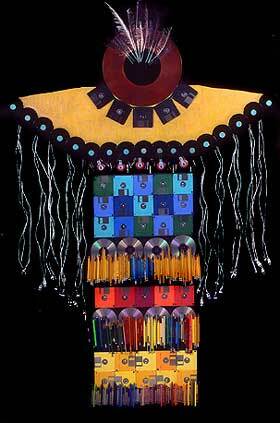 "Recording Memory Totem," painted wood, floppy disks, hard drives, pencils, USB cords and other writing tools. She also gave illustrated lectures on art and technology and how artists use computers to make their work and run their businesses. Her most popular class is still Ethics of Digital Photography. "I have great pictures from art, politics, journalism and advertising that illustrate the main points," she said. "I've been giving lectures on the subject for over a decade. In the early years people didn't even know what digital photography was. Now they're taking pictures with their phones." Bonnie doesn't teach many hands-on classes anymore, but she is going to the native village of Allakaket in the Arctic Circle to teach computer drawing to Athabaskan children as part of the Alaska art-in-the-schools program. "I'll spend two weeks working with 50 students using a Wacom drawing tablet and pen instead of a mouse, and some wonderful software that mimics the line quality you get from a variety of media, like chalk, oil, paint, pen or pencil," she said. Bonnie has taught both in village and small-city schools in Alaska. "It's always an adventure because life there is so different," she said. "A big difference is the light. It changes what you know about time and your perspective of things." 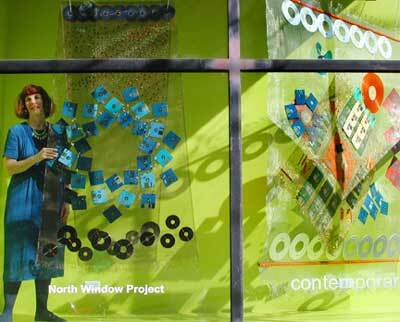 Through May 9, Bonnie has an installation in the North Window at Contemporary Crafts Galley, 3934 SW Corbett Ave., Portland. "Liberty on the Edge" (left), "Memory Quilt 1." The idea to do the pieces like real quilts, but using screen and floppy disks rather than fabric, came about because inside the gallery is a national art-quilt exhibition. "It's a natural fit," she said. "However, because my work isn't geometric, I had to fit the geometric idiom into how I work  make it less rigid. To make this piece I played with the disks on a large table, then photographed each result. "It was just like a kid playing with blocks." For the second panel Bonnie used the disks, print-side up. She was well into the piece when she noticed the company name showing up along the edge. Every six inches was the word "Liberty." The title of the piece became "Liberty on the Edge." "I just can't resist making a piece political," she said. "Reflection at Middle Age," painted wood, crocheted wire, found objects, digital photography. Bonnie is also excited about a project she's starting for Maryhill Museum and the Farmland Trust. A dozen artists, four each from Idaho, Oregon and Washington, were chosen to do artwork about sustainable agriculture. They'll visit a farm to see agriculture first hand and to get ideas. The art will be exhibited at Maryhill starting March 18, 2006. "I'm a long-time, organic gardener," she said. "I don't know what form the art will take but it will be a logical extension of what I do  that mixture of materials that will tell a story about growing our food." Even after a lifetime of being an artist, Bonnie's goal is to keep making art and to keep the making of it interesting and engaging to her and the people who look at it. "If the fates are good to me I'll continue to have more ideas for art than I can make," she said. "And new tools and techniques will pop up every so often and influence me." If you're a North Portland artist and want to be added to the Art on the Peninsula database, or if you'd like info on the annual Portland Open Studios in October, e-mail Bonnie. E-mail Bonnie at bonnie@bonniemeltzer.com and visit her Web site. You can reach Kathy at kanderson138@comcast.net, and draw on other Sketch Pads.